It will be twice the fun in Columbia this week for Hillcrest High School, as both the Hornets and Lady Hornets have qualified for the Class 4 Show Me Showdown. The Hornets (18-12) will face Notre Dame (Cape Girardeau (26-4) at 3:30 p.m. on Thursday afternoon in one semifinal, while the Lady Hornets (23-7) will play MICDS (25-2) at 6:50 p.m. in a girls semifinal. For the Lady Hornets, it was a history-making 64-54 state quarterfinal win over St. Francis Borgia, as that win propelled Hillcrest to its first-ever girls Final Four appearance. The Hornets, who won the 2010 Class 5 state championship and were the Class 4 state runner-up in 2012, beat the #2-ranked team in the state in Rolla. Senior standout Brady Petry weaved through traffic and hit a nifty up-and-under lay-in just prior to the final buzzer to give Hillcrest the 62-61 victory in the state quarterfinals played at Southwest Baptist University in Bolivar..
Rolla had lost just twice all season, with both losses to Waynesville within the span of a week in late December and early January. The Bulldogs entered the state quarterfinals on a 17-game winning streak, which included an 86-50 rout of Hillcrest on Jan. 13. “Rolla is a very good team,” said Brock. “They are well coached and have so many weapons on the offensive end. Our guys competed hard from the opening tip, and we were very fortunate to win the game. We felt that if we could keep the game close into the last few minutes, we could make the plays down the stretch that we needed to. We got some breaks and made some shots, and that always helps. 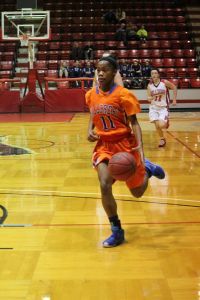 Petry scored 32 points for the game, with 23 of those coming in the second half. Running mate Lavell Hale poured in 24 points of his own, with 18 first half points to keep the Hornets in it. In all, the duo combined for 56 of Hillcrest’s 62 points. The Lady Hornets entered their state quarterfinal game with a 22-7 record, with all seven losses coming to state-ranked teams. Hillcrest used its quickness and smothering defensive pressure to force Borgia turnovers, which helped key the Lady Hornet speed game…at least through the first three quarters. 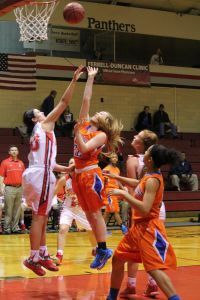 In order to secure the program’s first Final Four berth, though, the Lady Hornets had to earn it at the free throw line. Hillcrest, which never trailed in the game, buried 19-of-24 free throws in the fourth quarter alone to post the 64-54 victory. The turnaround for the Hornets this season has been remarkable. The enigmatic Hornets have about as up-and-down a season as is possible, with mini winning and losing streaks sprinkled throughout the schedule. The same team that lost three in a row in mid-January reeled off seven wins in eight games, with the only loss to state-ranked Nixa. The Hornets followed that up by losing three-of-four to close the regular season, but have now won five in a row heading to Columbia. Interestingly, the Hornets were undefeated (12-0) when they had at least one practice before their next game. That is a sign of great coaching, whether the humble Brock wants to acknowledge it or not. “Anytime you go into a new situation, there are always adjustments to make,” said Brock. “I think those adjustments are amplified for a first-year head coach. We have a young team and a young coaching staff, and we have been learning together throughout the season. We aren’t perfect. My players have made mistakes and I’ve certainly made mistakes, but our focus is learning from those mistakes and moving on to the next play. The other Hornet starters include 6-foot-2 sophomore Shahn Clark (7.5 ppg, 3 apg), a very good passer and playmaker, and a pair of freshmen in sharpshooter Cole Pryor, who hits 42 percent of his three-point attempts, and Tim Washington, who averages 8.2 points per game and shoots a blistering 76 percent from the field. 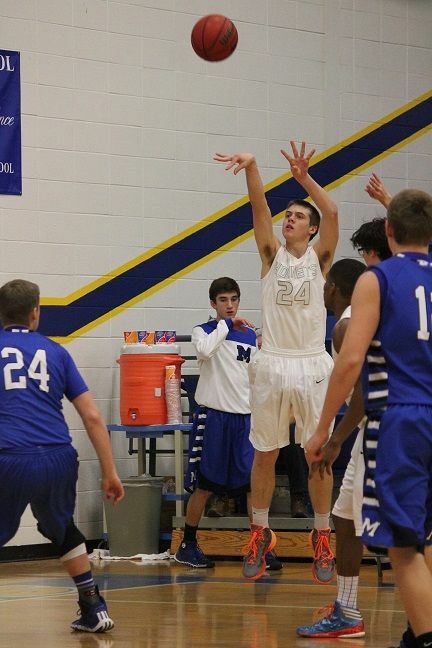 Junior Jevazz Podurgiel is high energy guy off the bench for the Hornets. One safe bet all season long has been that the Lady Hornets would be at a height disadvantage regardless of who they were playing. 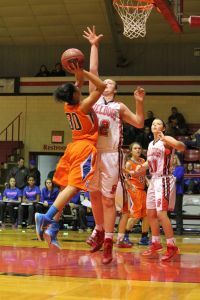 Of course, Hillcrest’s opponents have often been at a speed disadvantage to the Lady Hornets, who use harassing ball pressure to force turnovers and speed up the tempo. 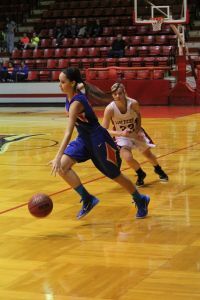 Kelsie Cleeton, a senior, is certainly the Lady Hornets’ headliner and best player, but is far from a one-player show. Gerald has had a solid junior campaign, and has helped Cleeton with the scoring load. Cleeton actually has a non-identical twin sister, Kaelyn Cleeton, whose game is also not identical to her sister’s. 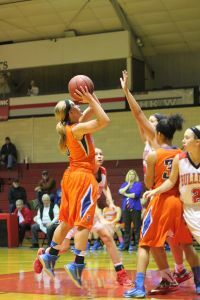 Kelsie, who is averaging over 20 points per contest, can hit an outside jump shot (with her tongue hanging out…always!) or get to the rim off the bounce for and-1 opportunities. Kaelyn, on the other hand, is content to roam the three-point line awaiting a kick out from her sister or Gerald for an open bomb. 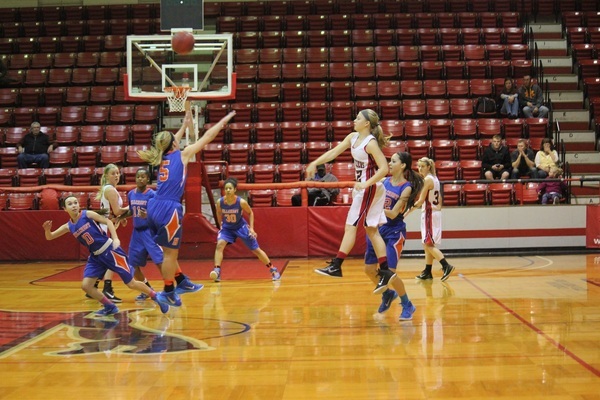 Kaelyn also is one of the team’s best rebounders. The rest of the Lady Hornet rotation includes Beam, a 5-foot-7 senior, as well as senior Haley Harrison, and juniors Mikhala McCullough, Laurnea Jarman, and Jordan Pryor. “We work well together and have been close since day one,” said Pryor. “We have heard from others that it was a difficult task that just gave us the motivation and determination to make it happen,” said Jarman of the Final Four run. The Hornets will be facing a tough task in trying to beat a Notre Dame team that has only lost one game since Christmas. The Bulldogs, led by first-year head coach and Notre Dame alum Paul Unterreiner, are returning to the Final Four for the first time since 2008, when Notre Dame won a Class 4 state championship. Although the Bulldogs have a couple of would-be starters out with ACL injuries in Derek Hulshof and Grant Ressel, Notre Dame features a balanced attack in which any one of a handful of players can lead the team on a given night. Senior Quinn Poythress, a 6-foot-7 monster in the middle, is the Bulldogs’ leading scorer and best player, while fellow senior Tanner Shively is averaging 13 points per game. Sophomore guard Blake Bauwens (9.6 ppg) and senior Dean Crippen (8.3 ppg) are capable scorers, while senior Thomas Himmelberg and junior guard Ross Essner play important roles for the Bulldogs. The Lady Hornets will also have their hands full with MICDS, who will also be making its State debut Thursday night. MICDS will carry a 16-game winning streak into the state semifinals, which includes the lady Rams first-ever victories beyond the district tournament. The Lady Rams feature a pair of 16-points per game scorers in juniors Rachel Thompson (16.7 ppg) and Abigail O’Keefe (16.6), who has hit over 60 three-pointers this season and shoots better than 40 percent from beyond the arc. Maya Howard, a 5-foot-7 senior guard, averages 13.5 points, 4.3 rebounds and 2.5 steals per game. As Brock wraps up his inaugural season on the bench at Hillcrest, he is in the unique position of having a wealth of knowledge and experience at his disposal. Brock’s father is Skip Brock, who just finished his first season as the boys head basketball coach at Carl Junction. Skip guided Mt. Vernon to multiple Final Four appearances, though, prior to taking the job at Carl Junction. Hillcrest is also sharing this unique “double dip” trip to State with Bolivar, as the Liberators will also be taking both their boys and girls teams to State this weekend. It says a lot about the state of basketball in the region that half the Final Four field in Columbia hails from the Ozarks. “It shows how good and competitive our region is and that Southwest Missouri teams succeed throughout the season,” said Petry. Both the Hornets and Lady Hornets are heading to Columbia with a world of confidence. Don’t let the Hornets’ ho-hum 18-12 record or the height-challenged Lady Hornet line-up fool you. Both teams are supremely confident and playing their best basketball of the season. “We have always heard of ‘Survive and Advance,’ but we have been trying to say ‘Kill and Advance,’” said Harrison. If both Hillcrest teams are playing for state championships come Saturday? That would be killer!